President Trump this Wednesday leaves the Washington issues behind him to meet with US troops in Iraq, his first visit since he was elected US President. The President's plane left the Joint Base Andrews and landed at the airstrip west of Baghdad. 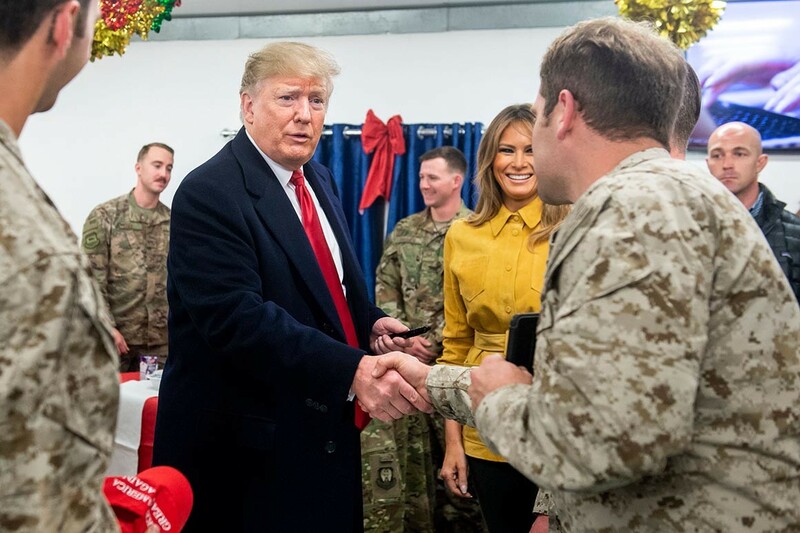 According to White House press secretary, Sarah Huckabee Sander said; "The surprise trip was made “to visit with our troops and Senior Military leadership to thank them for their service, their success, and their sacrifice and to wish them a Merry Christmas"
While in Iraq, Trump thanks the troops, and also defended his reasons for bringing US troops back from Syria. Donald Trump is also looking to visit the troops at the Ramstein Air Base in Germany on his way back to Washington. 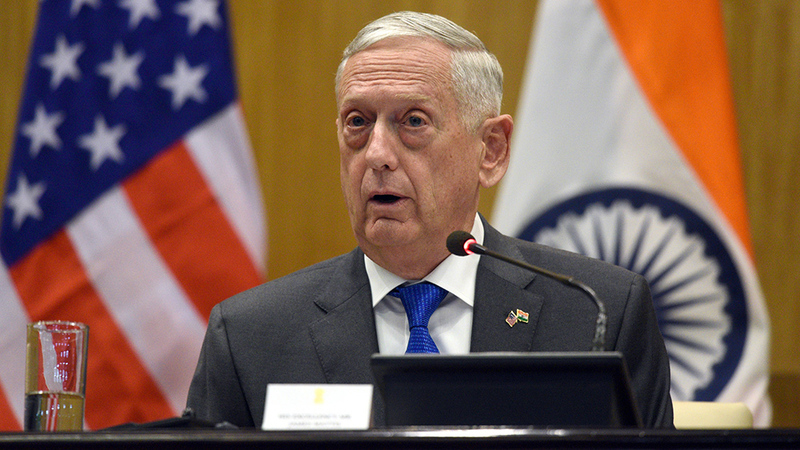 US Defense secretary, James Mattis has announced he will be leaving the position come February 2019, after Mattis cities policies differences with the US President Donald Trump. In the letter released by the secretary, he stated that America power lies in his allies, and the President has not given much credence to his allies. In a letter, Mattis did not follow the old-fashion of letter writing that praises President before announcing their resignation, instead Mattis rebuke the President, writing; "Because you have a right to a Secretary of Defense whose views are better aligned with yours on these and other subjects, I believe it is right for me to step down from my position. Because you have a right to a Secretary of Defense whose views are better aligned with yours on these and other subjects, I believe it is right for me to step down from my position." The news of the resignation comes after Trump claims victory for the war in Syria, and have announced that American troops will now return back home, a move that his party members, and defense officials have kicked against. Similarly, I believe we must be resolute and unambiguous in our approach to those countries whose strategic interests are increasingly in tension with ours. It is clear that China and Russia, for example, want to shape a world consistent with their authoritarian model - gaining veto authority over other nations' economic, diplomatic, and security decisions - to promote their own interests at the expense of their neighbors, America and our allies. That is why we must use all the tools of American power to provide for the common defense. 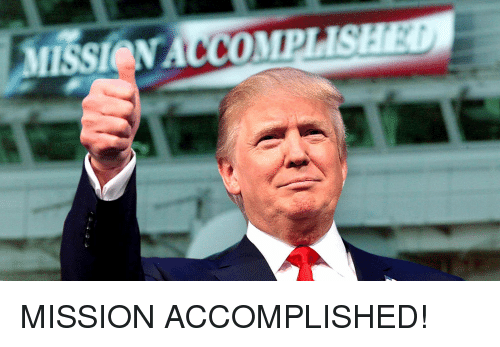 One of Donald Trump campaign promises to the US people is defeating the Islamic State terror group, ISIS, and in a new video released by the President's team, Donald Trump believed ISIS is defeated, and it is time to bring back the US troops in Syria. The US troops have helped get rid a lot of the members of the group, and only remains a handful of the fighters in the North-Eastern area of Syria, and security chiefs want that the US troops maintain its presence in the country to make sure that the terrorist group does not rebuild again. The White house and Pentagon have now concluded that it will be moving to "next phase" of the campaign, but did not give further information about the new phase it will take. Senate Republicans have kicked against the idea of President Trump pulling troops out of Syria, and one senator using his voice is Lindsey Graham ,that have now called it "a big gift" to the Iran ISIS. In the press conference released by Lindsey Graham. He said " I have tried to help President Trump where I can ... but I find myself in the situation where the best way I can help the president is to tell him the truth as I see it." 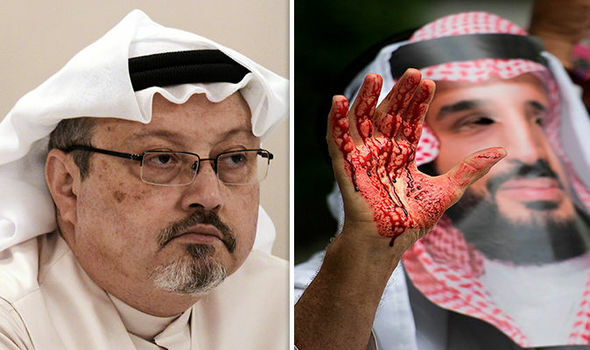 The attack on journalists in 2018 has increased, and more this has shown increase in hatred for free press, this includes an increase in verbal attack from the United States President Donald Trump and also the killing of Washington post reporter, Jamal Khashoggi, a royal insider who became a critic of Crown Prince Mohammed bin Salman in Saudi Arabia. There has been an increase of 15% above last year killing of journalists, and 63 journalists have been reported killed in 2018.The number is said to increase to 80 if media workers and citizens journalists are included in the figure. This is a report by the group, reporters without borders. According to a PDF report released by the group, the five deadliest countries for journalists includes, United States, India and Mexico. This is the first time United States is included in this list after the killing of five employees of Capital Gazette newspaper in July. The three most deadliest countries before now includes Syria, Afghanistan and Mexico. At this time, 348 journalists were being detained worldwide, compared to 2017, which was 326. China, Turkey, Iran, Saudi Arabia and Egypt are the country with the highest number of journalists detained. Donald Trump had denied knowing about the meeting between Russian agent and his son, Donald Trump Jr., but as invesigation into Russian meddling intensifies, and former Trump lawyer now sings for Robert Mueller, there are new reports that Donald Trump himself knew of the meeting. Trump who seems to have known about the meeting inform his followers during a campaign stop that he got dirt on Hillary and Bill Clinton, and will release a report soon in 2 days. Though Donald Trump never delivered on the promise as it seems he never got any good information from the Russian agent. Donald Trump and his then campaign manager, Paul Manafort met with Russian attorney Natalia Veselnitskaya in 2016 with the hope of getting damaging information on Hillary Clinton, but she failed to deliver to the men, and candidate Donald Trump was unable to then unable to deliver on his promise. Also, Trump's lawyer Michael Cohen has also told special counsel Robert Mueller that he would discuss everything he knows about the Trump tower's meeting. U.S. President Donald Trump has canceled high talk with North Korean leader, Kim Jong-Un, accusing the North Korean leader of "tremendous anger and open hostility." The U.S. President canceled talks on Thursday, accompanying the cancellation with a letter. The peace talk between the duo was set up for June 12 at Singapore, and there have been preparation for these talks between the two parties involved. In a letter released online and released on the internet, the U.S. President praised the NK leader for releasing the recent three Americans in his custody, but wrote the meeting will not hold, he wrote "Sadly, based on the tremendous anger and open hostility displayed in your most recent statement, I feel it is inappropriate, at this time, to have this long-planned meeting." 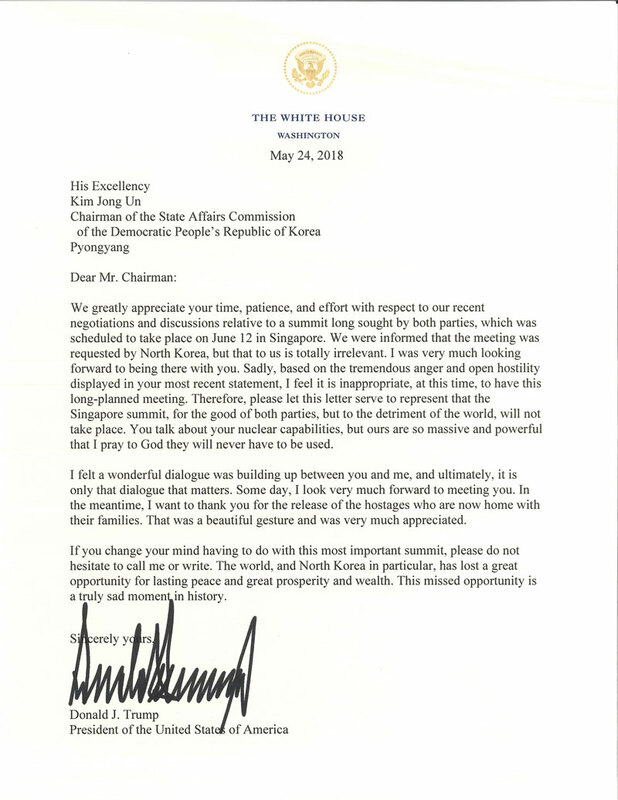 Trump also reminds Kim about the U.S. nuclear abilities, and wrote; "You talk about your nuclear capabilities, but ours are so massive and powerful that I pray to God they will never have to be used"
The South Korean government had performed a major role to set up the meeting between the U.S. and North Korea, and were caught by surprise at the news from the Trump's government. It is very regretful and disconcerting that the US-NK summit will not happen as planned. Denuclearization and the lasting peace on the Korean peninsula cannot be abandoned or delayed as they are the historical assignment. The sincerity of the affected parties who have been working to resolve the problem has not changed. It is hard to resolve sensitive and difficult diplomatic issues with the current way of communications. (We) hope that the leaders resolve problems through direct and close dialogue. The latest development was a surprise as North Korea was seen dismantling some of its nuclear test site. North Korea had cancelled a major talk with South Korea out of anger, after a joint military drill in the Korean peninsula. 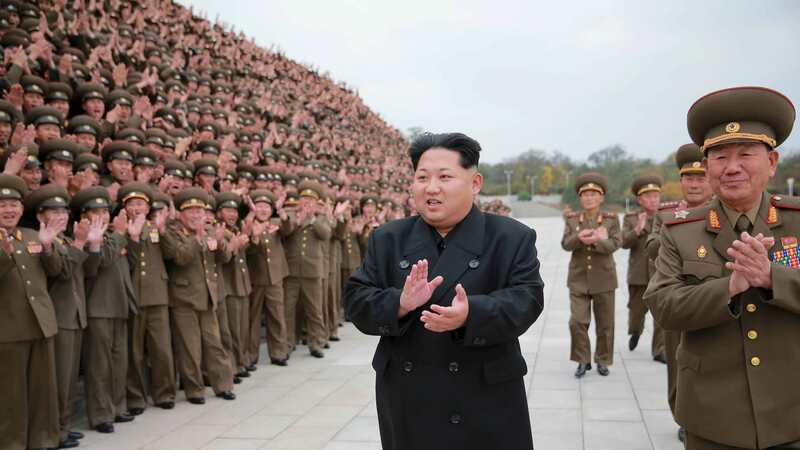 Recently, North Korea had lashed out at the U.S. Vice-president, Mike Pence after he said that the North Korea government might end up like Gaddafi Libya government. A top North Korean official, Choe Son Hui, responding to Pence's remarks said; "As a person involved in U.S. affairs, I cannot suppress my surprise at such ignorant and stupid remarks gushing from the mouth of the U.S. vice president"
Trump presidency continues its deep dive into scandals after a report surfaced online recently that Donald Trump's lawyer, Michael Cohen had received $400,000 to help Ukraine fix talk between Ukraine and the White House. The payment was reported to be done by an intermediary acting for the Ukranian leader, Petro Poroshenko. A high ranking member talked about how the meeting was able to hold, and how the money got into Michael Cohen's account. Mr Poroshenko decided they needed to bring in Mr Cohen, who at the time was known as Trump's lawyer and fixer. The registered lobbyists and the Ukranian embassy in Washington could only get Poroshenko a little photo-op, but he needed something that would look like talks between the two leaders, and that was when an idea of Cohen came to light. Ukranian leader then asked a loyal MP to establish talks with Cohen. 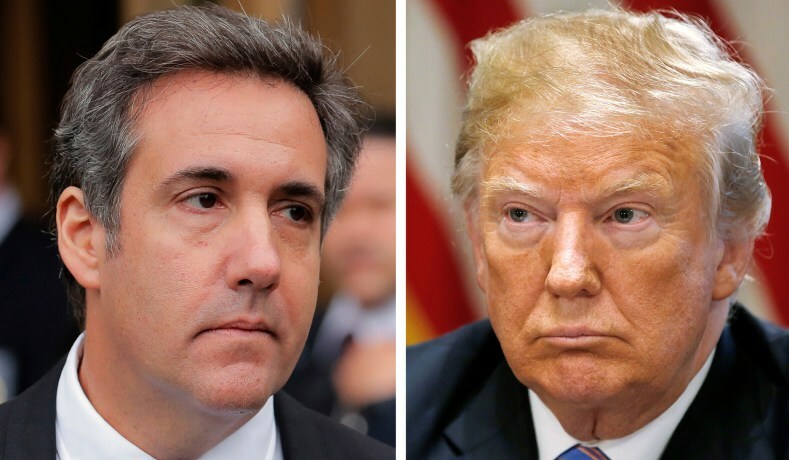 The money was initially channeled through the Jewish charity in New York state, Chabad of Port Washington, and then to Cohen, in the sum of $400,000. Though there is no report or knowledge of Trump's knowledge of the accused bribe. Michael Cohen has denied the reported story, so is the two Ukrainians that had opened the backchannel for their president. 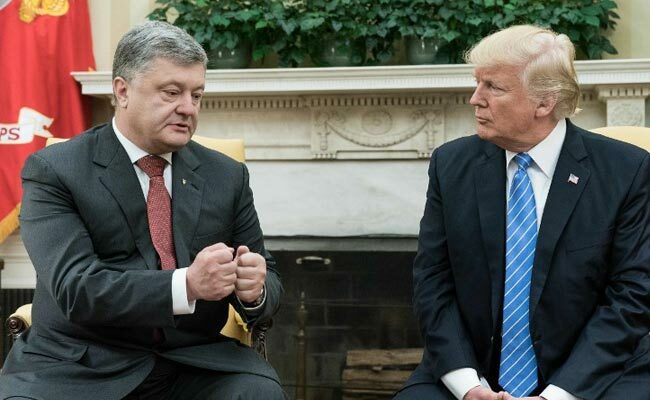 Mr Poroshenko up until the day of the meeting was uncertain about the amount of time he could have with the U.S. President, and official reports on the day of the meeting had said that the Ukrainian leader would only drop by while Trump was having a staff meeting. Mr Poroshenko was not happy about the embarrassment of small talks and just a handshake he was getting after the hundreds of thousand dollars he had spent for real meet and greet, and negotiation started till the early hours of the day of the visit. After the Robert Mueller team investigated Psy-group, an Israeli company for its online manipulation tactics during the 2016 elections, the company shut down. Psy-group is also known as Invop Ltd. , and it is listed under the Israeli state registrar’s database. The company during the 2016 U.S. election launched an online manipulation campaign. According to the New York Times, Donald Trump Jr. met with the Israeli media specialist Joel Zamel months before the election, that was also when the company was developing a proposal for a "covert multimillion-dollar online manipulation campaign” a move to help Donald Trump win the 2016 election. According to the report, Zamel learnt that the campaign would be illegal in the U.S., therefore wanted to end it, but he later got a $2 million from a Trump associate. 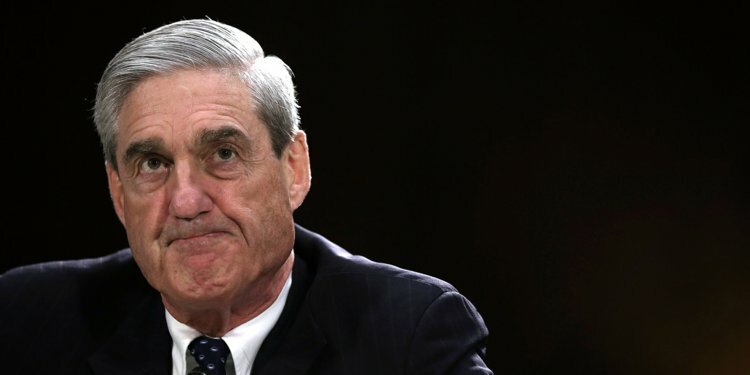 He had now gone under investigation by the Mueller's team, and also the employees ofthe Psy-group have also been questioned by the FBI in Israel. The FBI also worked with local law enforcement to seize all computers owned by Mr Zamel. Also, Cambridge Analytica, a company that stole Facebook information and was in the midst of numerous scandal after it was known that the company ran different campaigns to help the then candidate Trump win, had declared bankruptcy.